TataCliq Flash Sale is live, Grab some best selling cool products upto 90% off at flat Rs. 70. Offer valid only for select pincodes. This offer is beginning at 07:00:00 a.m. (IST) on 10th August, 2016 and ending at 18:59:59 p.m. (IST) on 10th August, 2016 (the “70/- flash sale period”). You must make a valid purchase between the 07:00:00 (IST) to18:59:59 p.m. (IST) in offer period, last day of which will be 10th August 2016. To enter, you must: (1) shop either the Website, Mobile Site or Mobile app of Tata Cliq during the Contest Period to be automatically eligible for this flash sale. All products predefined and communicated on the date by TATA CLiQ shall be available for a sum of INR 70/- till stocks last for the stipulated time period. All standard taxes and charges can be levied over and above this amount. Every hour a new product/ set of products will be available on the flash sale & any previous product on sale will revert back to original prices. Customers need to apply the specified Coupon code to avail of this offer. 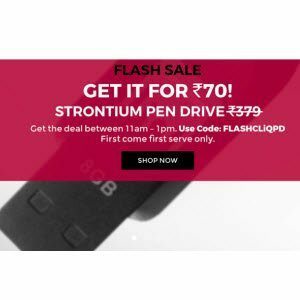 How to Buy TataCliq Flash Sale Rs. 70 Online? Get code from image and click on banner to open products. Use code while buying to get discount.